Printed Dry Wipe Whiteboard Vinyl is perfect for fully covering existing whiteboards with your custom graphics. Printed at 1440dpi resolution in full colour, then laminated with our specialist dry-wipe polypropylene. This creates dry wipe panels with permanent base graphics and is suitable for use with dry wipe markers. The clear coated film wipes clean with a dry cloth. Works for both magnetic and non-magnetic whiteboards. 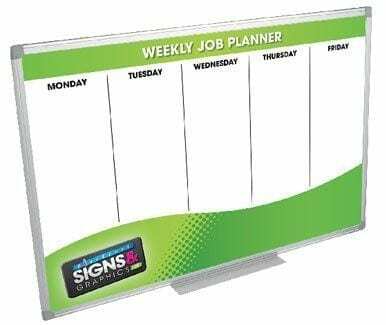 Ideal for Planning Boards, Production Scheduling, Menus, Events Boards, Sales Performance Boards. Easy-apply vinyl which lessens the chance of creases and bubbles when applying.